Want an easy way to identify your luggage? 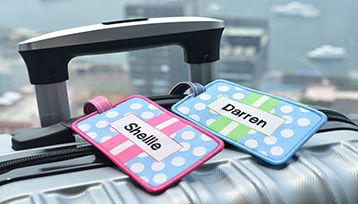 These trendy mini personalised luggage straps provide a hassle-free solution for labelling your belongings. Premium quality personalised woven luggage straps perfect for travelling interstate, overseas or for school camps. Premium quality woven luggage straps with Australian or Travel icons perfect for travelling interstate, overseas or for school camps. Durable quality woven luggage and school bag tags perfect for school bags, luggage cases, overnight bags, sports bags, gift ideas and more. Make baggage collection at the airport easy with affordable luggage straps for suitcases and luggage bag tags. Cash's Personalised Luggage Straps are elasticised and tightly wrap around your suitcase. They clip together using a durable security release buckle which helps to ensure the contents of your suitcase remain safe for the duration of your travel. The minimum length of the strap is 120cm and will extend to a maximum length of 180cm. Cash's Personalised Luggage Straps are currently available in a range of bright colours. 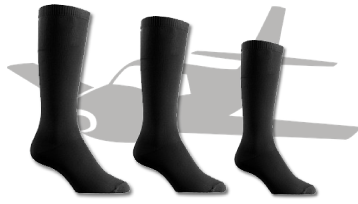 These items will take approximately 2-3 weeks to be delivered and will be sent separately to clothing label orders. 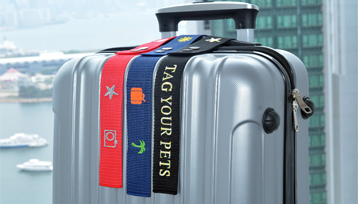 Personalised luggage straps for suitcases are a great idea, as you can immediately locate your travel bags in a busy airport. 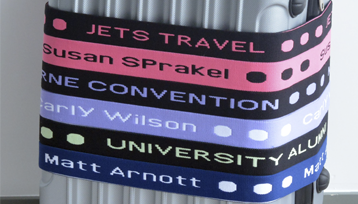 Before you go away on holiday, be smart and ensure you buy our bright and colourful luggage straps for suitcases or any quality name tags and badge from Cash’s Nametapes.